Kulich Cake with almonds. Recipes from Russia. Yeast Kulich Cake with almonds. Easter table couldn't be without Kulich, holiday ceremonial bread. 1 kg (2 lb) flour. 1/2 l (0,5 pint) milk. 60 g (2,5 oz) yeast. 200 g (8 oz) sugar. 300 g (12 oz) butter. 200 g (8 oz) peeled almonds, chopped and toasted. 150 g (6 oz) raisins. 1. Bring milk to boil and cool down. Dissolve yeast in a part of milk, add 1 tbsp sugar. Stir in flour in the rest of milk, add yeast and mix thoroughly. 2. Cover with towel and put in a warm place. Kulich dough must be "coddled" and "cherished", the temperature of the dough must not less than 29-30 C / 86 F.
3. Beat up 5 yolks with the rest of sugar. Melt butter, chop finely a lemon and a half of almonds. Add yolks, melted butter, chopped almonds and lemon, raisins, salt to the risen up dough. At the end stir in beaten to a white foam egg-whites. Knead the dough carefully upside down. 4. 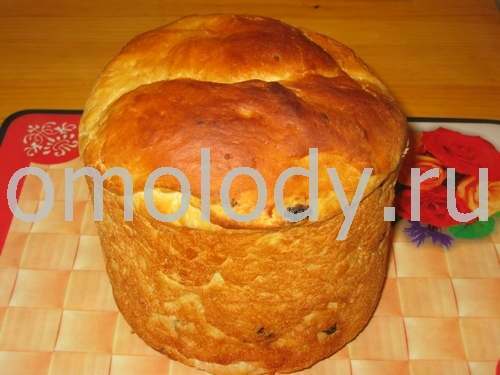 Grease the form for Kulich with soft butter, sprinkle with flour and pour in the dough half. Leave in a room to rise. When the dough is up to the top, brush the top with yolk and sprinkle with almonds. 5. Bake in the oven 180 C /356 F. The duration of baking depends on the size of Kulich and can last 1-2 hours.